For some reason for the last two weeks, it seemed like some kind of La La Land for me…. I don’t mean that the situation has changed or gotten better. However, my son came to visit, somehow we have had just enough money to feed him and his girlfriend and pretend that everything was ok. Unfortunately, La La Land ended on Friday evening when reality set back in. No money for food or gas, a very serious job offer seemed to have been put on hold (and we were really counting on this to change everything). I was thinking how different last Sunday was, when Stefanos and I saw a glimmer of hope with this job. It was/is so close. We sat down and made serious plans on where to move and how to keep what we have learned through all of this suffering and live moderately but this weekend, straight down the tubes back to despair and worry. Last night as I was folding clothes and putting socks together I could see that my boys have no socks. I was so sad, I can’t even buy them something so simple as socks. To even write this is freaking me out! As it stands, I have to find a way to borrow 1000 euro (for a week or two). First, to pay off the rest of the money I owe to my university for summer classes in order to get my financial aid to pay for my fall classes and have a little left over to survive on for a month. I want to borrow it from my mom or my dad but I know that they may not be able to help. Therefore, avoiding rejection I don’t even try. I must take 350 euro of that to go and make this, “I am waiting for my visa” paper that they gave me but risk losing it in September because they may take it away. As of Saturday, they have decided in Athens to sweep the country of illegal aliens. So back to being scared every night my 17-year-old daughter goes out to have fun with her friends. She must carry her papers with her at all times. However, until I go to get the “I’m waiting paper” officially known as a veveiossi, she would have to carry a 27 page legal document from the court or risk going to this camp they have built for illegal aliens. http://www.athensnews.gr/portal/9/57507 It’s scary! I can’t sleep at night wondering if she is ok or not. But, I also cannot keep her in the house. The government decides to round up foreigners (when there are just as many Greeks participating in all that is in the article). Spend another I don’t know how many millions on a holding camp and not rounding up instead the crooks who are in Mykonos or other islands in their summer houses that they bought with dirty money from not paying taxes etc, Or people like those idiots that hired me and then didn’t pay me my salary and just disappeared. You know I spend a lot of time reading these stay positive books as I have listed in my Good Reads side bar. My biggest question for the authors is; how exactly do you stay positive in this situation? Really? I am an extremely positive person normally and in many difficult situations. But facing how to feed your kids, your water to be turned off any day now, no phone, no internet, and having to move out at the end of August (to I don’t know where), no possible job prospects here in Greece and no way to move somewhere else to find a job. HELP!!! I am trying I really am but it is so hard to stay positive and focused. AAAAHHHH, I want to scream! Sorry I just can’t even stay organized for this post. So even with NO money, I took 20 euro from Taiyo (my son) and Stefano 25 from his mom to make it through the weekend. We went to the laiki (farmers market) on Saturday and spent only 10 euro. Let me tell you what we got for that, which will freak most Americans out. Why I say that? Because at least food here is cheap! I can feed six of us for a month on about 40o euro. For 10 euro we got; a watermelon, 15 apricots and kilo of grapes, 50 eggs, 2 kilos of tomatoes, 8 bell peppers, 4 onions, and a bunch of spring onions. We made our own Greek tavern on Sunday afternoon lunch and 8 of us ate stuffed tomatoes/bell peppers, feta cheese, fresh bread and cabbage/carrot salad for a euro each. I was really proud and it was Delicious! I love cooking and trust me I can spend A LOT on food but I have learned how to be a frugal shopper and chef!! We went to the beach on Saturday and Sunday late afternoon and yesterday we watched the sunset. It is crazy hot here so we need that jump in the sea! It is great for removing all the fear and negative energy. 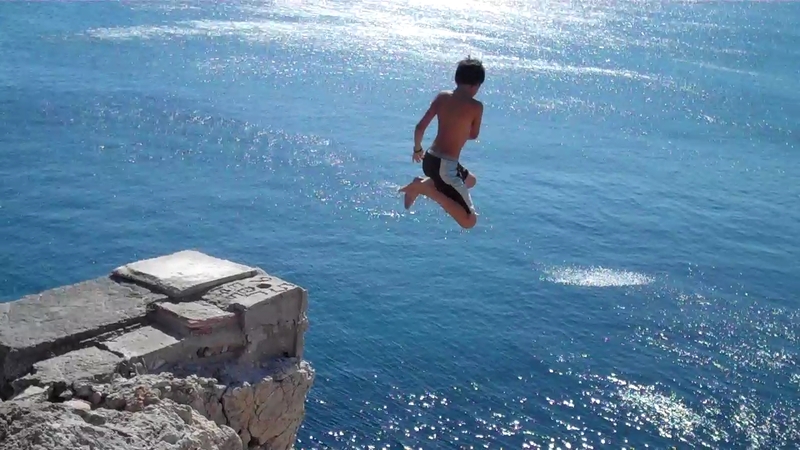 So this it’s not too depressing here is a picture of my 11-year-old (totally crazy) jumping from 10 meters!! Happy Monday everyone… Let’s hope it is a better week!! 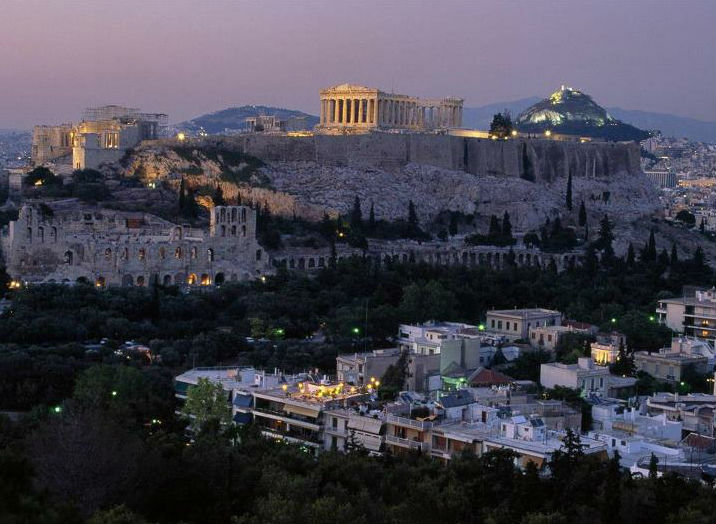 Tags: Athens, Fear, Food, Greece, help, kids, Positive, Sea, Visa, Work | Permalink.